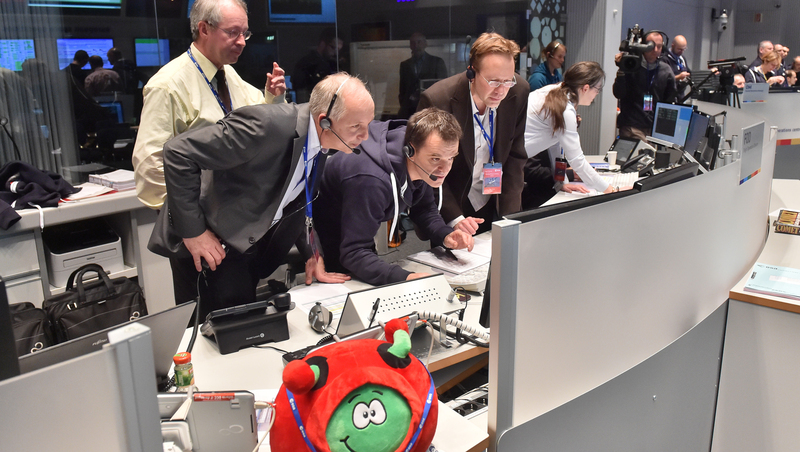 Yesterday, the European Space Agency (ESA) made planetary exploration history. Rosetta became the first mission to successfully land a spacecraft on the surface of a comet. 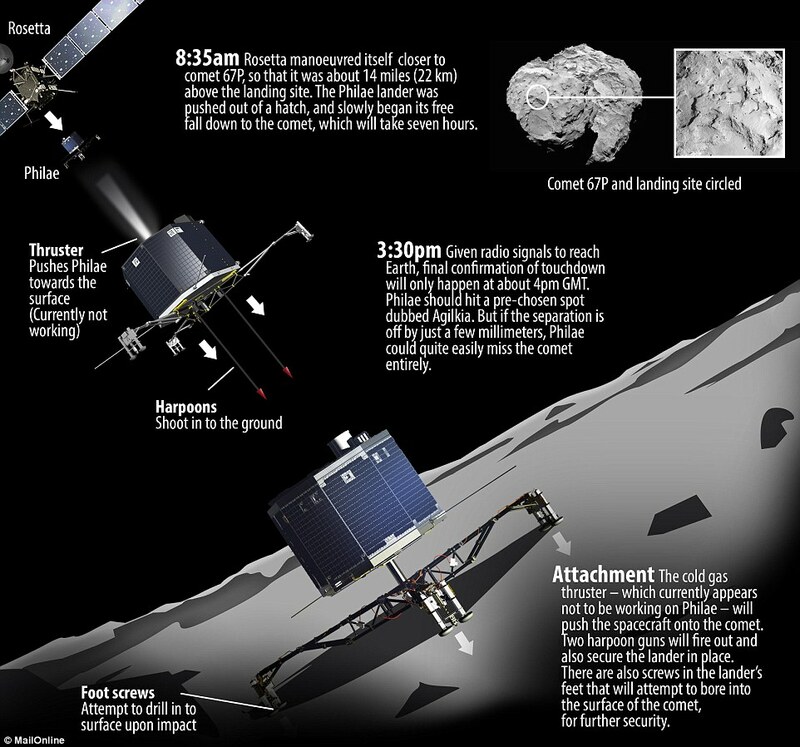 The Philae lander detached from Rosetta on November 12, 2014 at 08:35 UTC and landed seven hours later at 15:35 (8:35 am in Tucson). A confirmed landing signal was received at 16:03 UTC (9:03 am for us). The OSIRIS-REx team in Tucson gathered together to watch the coverage of the landing. We put the live stream from ESA TV on the big screen in our Southwest Meteorite Auditorium, grabbed some bagels and a cup of coffee, and prepared to cheer on our European colleagues during this historic event. I arrived at 8 am to view the broadcast. 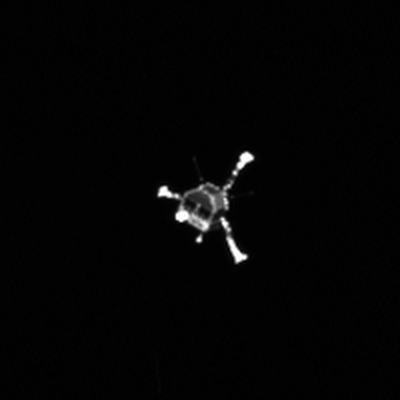 By this time, ESA had already released an image of the Philae deployment. I was excited to see that the landing struts had successfully deployed and that the release was on target and close to the baseline trajectory. I was concerned to hear that the lander’s cold-gas thruster was not working correctly. As I described in a previous post, one of our major concerns about sampling a small body is operation in the micro-gravity environment. Without this thruster, I knew the lander would have a difficult time staying in one place on the comet surface. The Rosetta spacecraft captured this great image of Philae right after deployment. The ESA coverage changed from a scripted program to a live shot of ESA’s Space Operation Centre, ESOC, in Darmstadt, Germany. Over the past couple of years, the OSIRIS-REx team has developed a productive collaboration with the Rosetta operations team. A delegation from our mission has travelled to Darmstadt on several occasions to discuss navigation challenges, landing site selection, and science operations challenges. We watched with baited breath while our friends and colleagues in Germany waited anxiously for the signal from Philae indicating a successful landing. The OSIRIS-REx team cheered on our European colleagues during the Philae landing sequence. The expected time for contact came and went, and no signal was detected. At this point, I really started to empathize with our friends overseas. I flashed forward four years, to the time when OSIRIS-REx will descend down to the surface of Bennu to collect the sample. I had to get up out of my chair and I began to pace around the room. I started to think about all of the implications for our mission if the lander failed to contact the Rosetta spacecraft. First and foremost, I would have to deal with the media inquiries – I started reviewing some talking points just in case. Fortunately, we soon saw our colleagues erupt in cheers. We knew that they had received the landing signal. 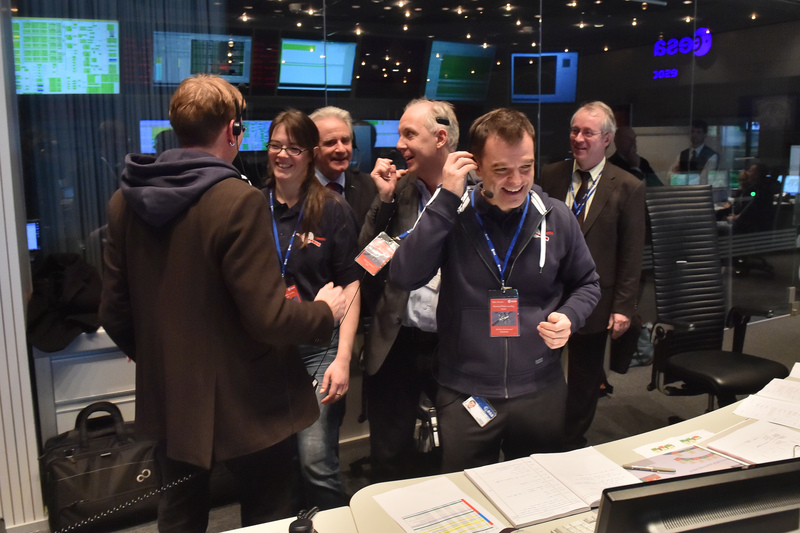 They had done it – they had become the first team to successfully land on a comet! We joined them in celebration of this amazing engineering achievement. The successful Philae landing made planetary exploration history. Shortly after the announcement of the landing, we learned that the harpoon system had not deployed. This anomaly, coupled with the loss of the hold-down thruster, really made me worry about the stability of the lander. Immediately I began to think about the interaction of Philae with the comet surface. Was the surface compliant enough to absorb most of the energy of contact? Or, did they hit the surface and bounce back off into space, only to come down at another location? As the information unfolded, it became clear that the latter scenario had occurred. Not only did Philae bounce once, it bounced a second time. The first bounce may have launched it over a kilometer above the surface, and the second bounce about 10% of that height. Fortunately, it seems to have come to rest and is able to transmit data back to Rosetta. The first Philae landing site looks like an excellent place for science operations. It is too bad they didn’t “stick” around. As some of the descent images came in, I saw that they were on an excellent trajectory for the first landing site. Though the area they had chosen was really rugged, it looked like they were headed for a nice flat plateau, right in the middle of their target area. From a navigation perspective, this landing was a huge success. They were able to compensate for all of the gravitational and non-gravitational forces that would influence the lander trajectory and deploy for an on-target landing. This is an area where OSIRIS-REx stands to gain from the Rosetta experience. We face very similar challenges in accurately navigating the spacecraft around Bennu. In addition, we have to design a similar trajectory to send the entire vehicle down to the surface to collect the sample. The good news is that we are designing our system to bounce off the surface. Rosetta’s experience confirms a fundamental aspect of our mission design! OSIRIS-REx will benefit from the many lessons learned by Philae. 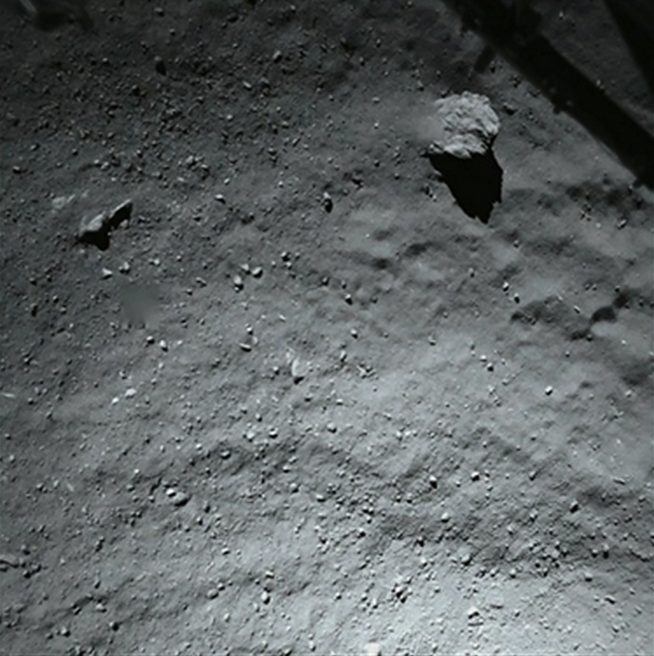 Just this morning, I saw the image taken from the lander at an altitude of 40 meters over the comet surface. 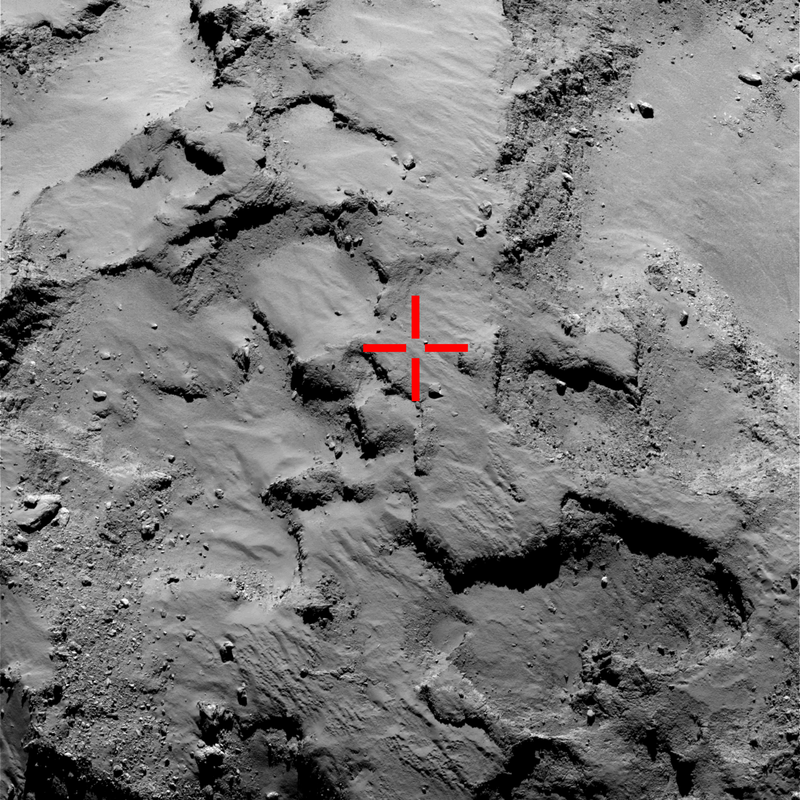 This image showed that the first landing site would have been ideal for science operations. The grain size distribution is intriguing, with one large rock (5-meters), and some coarse cobbles embedded in a fine-grained gravel or sand. This image represents a great opportunity for the OSIRIS-REx team. We are looking for test data for our data-processing techniques to determine the safety and sampleability of potential sites on Bennu. Having real data from a chosen landing site on a small body represents a great opportunity to test and refine our selection process. We can now ask the questions – how would OSIRIS-REx respond to this site? Would it remain safe during the five-second contact? Would we expect to obtain sufficient sample from this regolith? We will be addressing these questions and many more with detailed analysis of the data returned from Rosetta and Philae. The high-resolution imagery from Philae will provide excellent test data for OSIRIS-REx. Overall, ESA has achieved an historic scientific and engineering milestone. The data already returned from this mission have revolutionized our understanding of comets . . . and they are just getting started. The deployment of Philae is just the beginning of their exciting science campaign. The Rosetta orbiter will remain in the vicinity of comet Churyumov-Gerasimenko for at least another year. They will spend that time implementing their remote-sensing campaign in earnest. They can rest assured that, across the ocean, their OSIRIS-REx colleagues are cheering them on and are anxious to see the amazing discoveries that lie ahead. Warm tone, clear language and just the right amount of technical details 🙂 Great outreach work! The Rosetta’s navigation team did indeed a truly *remarkable* job putting Philae safely on the surface of 67P!!! Right on the chosen location! Now let’s hope for the best for Philae’s team in the next couple of days as they deal with the engineering challenges of a tilted lander and low sunlight exposure in a (still) unknown location. (I suppose that the performance of the retention mechanisms – harpoons, cold-gas thruster and ice screws – will also be thoroughly re-analysed in the coming weeks/months).